These yummies are always a huge hit and they're easy peasy to make. The truffles in the photo are actually peanut butter truffles that I served at Angel Party a few years ago. (Good photo, right? All professional and everything.) I made the peanut butter truffles with the same recipe replacing the Oreos with Nutter Butters. If you plan to make both kinds, put some chocolate sprinkles on one of them to tell them apart. The chocolate can be tricky--I melt about a half cup at a time in a glass Pyrex bowl in the microwave. Keep an eye on it so it doesn't burn and don't over stir it or it will get yucky. Stir it gently only if some of it didn't melt completely. The recipe is really simple and if you use a food processor, you don't need to wash a bunch of bowls! 3. 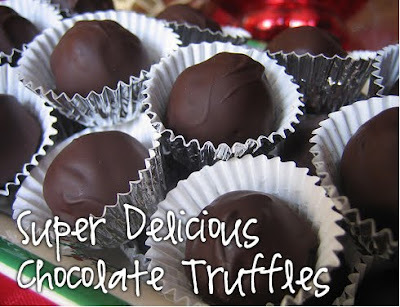 Dip balls in melted chocolate; place on a waxed paper-covered baking sheet. 4. Add chocolate sprinkles to make them all fancy-like. 4. Refrigerate 1 hour or until firm. Store leftovers in tightly covered container in refrigerator. 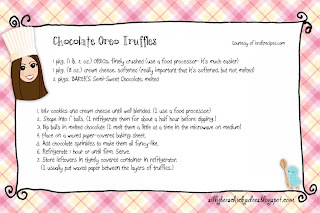 (I usually put waxed paper between the layers of truffles. 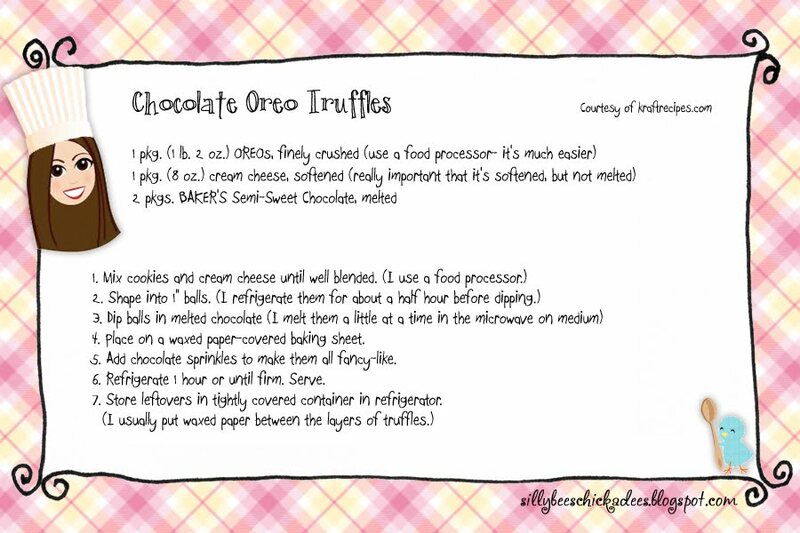 Click on image below to print out your very own recipe card!